An interface proposal that reduces the attention required for anaesthesiologists to run and supervise the system so that more focus can be directed towards the patient and communication with colleagues. During the project we visited two hospitals where we attended six different surgeries. It was valuable to experience surgeries as it gave us the opportunity to observe the Anaesthesia nurses and their workflow, in the right context. We also used ethnographic methodologies when interviewing nurses, helping us understand their thoughts and feelings about their daily routines. One challenge the Anaesthesia nurse encounters is the drug injection process on the patient: Depending on the patient's reactions to various variables, including patient's reactions to sleep-inducing drugs and surgery on inner organs, the Anaesthesia nurse must counteract them in order to keep the patient stable and unconscious. Yet, sometimes it is quite difficult to estimate the right amount of for the counteraction, and thus potentially harming the patient through injecting the wrong drug dose. The Sandbox concept allows the nurse to explore different alternative parameters of the Anaesthesia drugs and their effects on the patient before executing changes. When the nurse adjusts the parameters, the patient’s values will be displayed as they are getting affected. In this way the nurse can have a safe learning environment to explore and fail in the system, without harming the patient. This allows the Anaesthesia nurse to use the autopilot phase more efficiently, by for example preparing the landing phase in advance. I learn from you. You learn from me. The sandbox’s core lies in the collaborative partnership formed between nurse and machine; each party learns from the other. This information then contributes to the wider learning system, improving the depth and breadth of data. Sleep mode is indicated by a lone ring on a black screen. This feedback signifies that the Sandbox is on and ready for use. As the nurse picks up the Sandbox and touches the screen, it will change into the next mode. When adjusting parameters, simulated patient readings appear individually as they are affected. When tapping any of the 7 readings to highlight them in the central area. Once highlighted, more information is displayed. When executing changes 4 fingers are placed at touch points on the outer edge of the Sandbox and holding on for 3 seconds, to avoid accidental changes to the selected values. The product provides the nurse with feedback through haptics and a green completing ring. In the final stage the nurse submits the observations of the patient's physical responses to the changes executed. In this stage the tacit knowledge of the nurse and the knowledge from the machine are united into the cooperative network system. Anaesthesia nurses don’t know their Anaesthesia machines well as they could. One reason they are not using the machine’s full potential is because the sensitive operation theatre environment does not give any room to try out the machine in practice. Since the Anaesthesia machine is connected to the patient, no mistakes can be made that might harm the patient during surgery. The theme for this project focused around the vision of Anaesthesia in 2032. We tried to understand the Anaesthesia today through experiencing the daily routines firsthand and interact with professional users who have expert knowledge and experience using the Anaesthesia tools and machines. We also saw this project through a critical design perspective. Working prototypes allowed us to iterate and develop our concept. 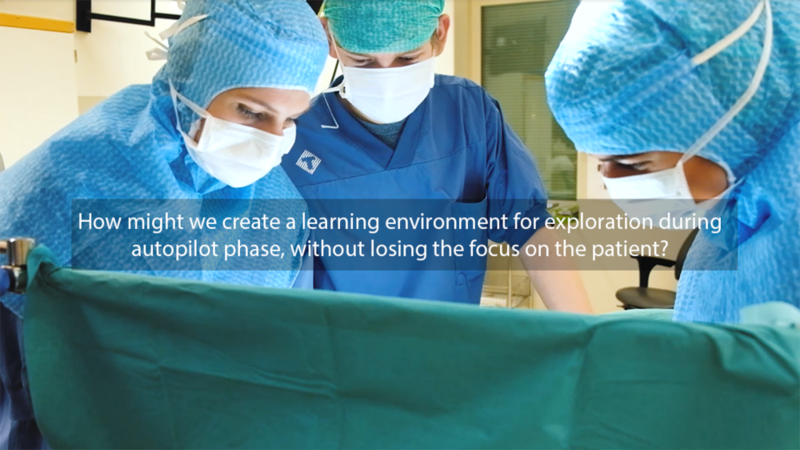 With Sandbox, Anaesthesia nurses can simulate drug adjustments and see an individual prediction of the patient’s response before they execute the changes into the patient during the surgery autopilot phase. When the nurse adjusts the parameters, the patient’s values will be displayed as they getting affected. In this way the nurse can explore and fail in the system, without harming the patient. With the use of the sandbox, the Anaesthesia nurse is able to use the autopilot phase more effectively, by for example preparing the landing phase in advance. In terms of learning more about the machine’s functions and settings, the sandbox gives Anaesthesia nurses a safe learning environment for exploring those functions and settings and trying them out during surgery.